A day after government data showed that the adverse impact of demonetisation on the economy was much lower than anticipated, two separate data releases have indicated that companies and consumers are getting over any persisting cash crunch concerns. 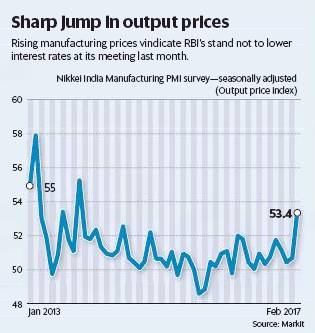 The Nikkei India Manufacturing Purchasing Managers' Index rose to 50.7 in February from 50.4 in January, suggesting further improvement in manufacturing sentiment. Meanwhile, domestic passenger vehicle sales rose 9.5% in February from the year ago, marking the second successive month of recovery after a 14.4% rise in January . A PMI reading in excess of 50 indicates expansion and contraction below that. 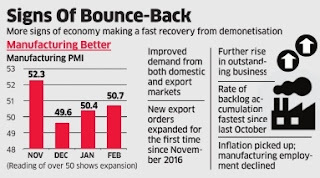 The index had signalled manufacturing contraction in December, the first full month after the November 8 demonetisation announcement, with a reading of 49.6. Data released earlier showed the economy clocked 7% growth in the October-December quarter, confounding most experts who had pencilled in sharply lower growth due to the currency swap. For the full year, the economy is expected to report 7.1% growth, slower than 7.9% in FY16 but much better than the near 6.5% forecast by most independent experts. CARE Ratings has raised its GDP forecast for FY17 to 7.1-7.2% from 6.75% earlier while ICRA sees it growing 7.1% from 6.8% earlier. The total volume of incoming new work increased for the second month in a row, whereas new export orders expanded for the first time since November 2016, PMI numbers showed. Rates of growth for both production and order books picked up marginally since January . On jobs front, the PMI survey showed a drop in manufacturing employment though the rate of job losses was marginal overall.